Or the sad tale of Sheba the Pundit. I think we all know that reading is a dangerous pastime. It can expand your mind and expose you to ideas that you never would have thought of by yourself. It can make you sympathetic to animals (and people) for whom you would otherwise not have the least bit of sympathy. It can teach you things that cause you to behave differently from those around you, to question the local ways, to think for yourself. All very, very dangerous things. Who was it who said that the pen is mightier than the sword? Sadly, Celeste and the Giant Hamster seems to be just as dangerous as any other book. I’m just recounting this story as a warning to the rest of you. 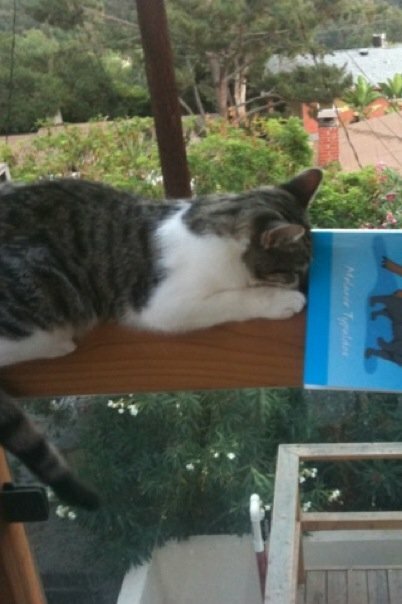 You may remember this adorable photo of my good friend Sheba the Pundit reading Celeste on a windowsill. This is an excellent reading location because of the wonderful light. But Sheba, being the cat she is, thought she could go one better with this perch. Can you see how far down it is? Believe it or don’t, Sheba fell! She used up a couple of her nine lives. I believe she is down to five now but most cats use up their extra lives when they are young like Sheba, so it’s not something to be especially worried about. At any rate, she hurt her back leg pretty seriously and required a vet visit, bandages and confinement (I think this makes her more like Ruby than like Celeste). 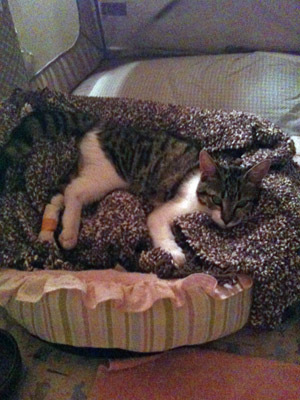 Here’s a photo of her in her sick bed. Her owner, Michelle Holman, says she is doing well. She is hand fed every 2-3 hours, which I’m sure she loves. She is on a human pain killer, which she probably also loves. It will take her a few weeks to recover and until then she will have to be confined, which she will not love. 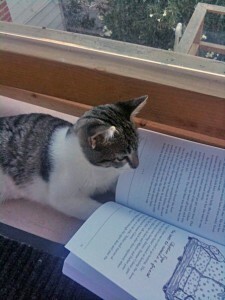 You can leave a note for Sheba and her owner as a comment to this blog. I’m sure she’d like to hear about other injuries suffered while reading.